Toronto, Canada – Following a successful meeting in the Canadian capital of Ottawa with the Honourable Ahmed Hussen, Minister of Immigration, Refugees and Citizenship, St. Kitts and Nevis’ Prime Minister, Dr. the Honourable Timothy Harris, arrived in Toronto, Canada`s largest city, to participate in the Toronto Global Forum – International Economic Forum of the Americas. Prime Minister Harris immediately engaged in a series of important meetings, which included sitting down with top executives from Amazon’s cloud computing arm, Amazon Web Services. The clear leader in the cloud computing market reported $12.2 billion in revenue and $3.1 billion in operating income profit last year and has brought in $12.3 billion so far in 2017. The Honourable Prime Minister met with Jeffrey Kratz, who is Director, Worldwide Public Sector for Latin America, Canada and the Caribbean at Amazon Web Services. They discussed a range of technology-related matters, including the role of information and communications technology (ICT) in education and healthcare delivery, as well as cybersecurity in the public sector, and innovation in disaster preparedness. 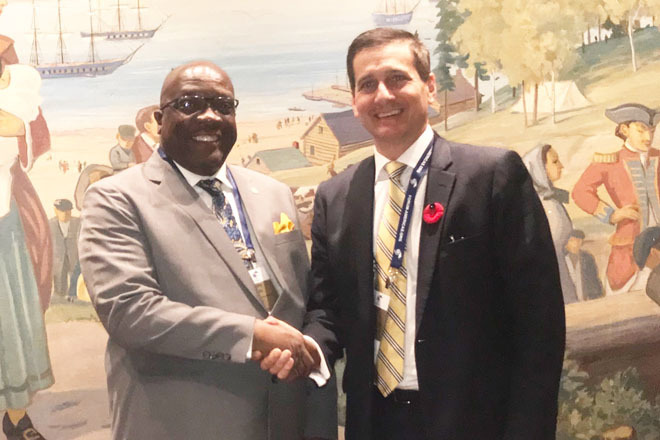 The Prime Minister of St. Kitts and Nevis welcomed the opportunity to dialogue with high-level representatives of the global leader in the cloud infrastructure services market on issues that are foundational to St. Kitts and Nevis’ development. Recognizing the great importance of information and communications technology, Prime Minister Harris’ Team Unity administration has made great strides towards modernizing government ICT services. Notably, the Federation of St. Kitts and Nevis received two awards for outstanding improvements in ICT development during the 14th World Telecommunication/ICT Indicators Symposium held in Botswana last November. St. Kitts and Nevis climbed a remarkable 20 spots on the Global ICT Development Index last year – ranking 34th (with a value of 7.21) out of 175 ranked countries. In comparison, Canada ranked 25th (with a value of 7.62). Significantly, no other country on the list made such a dramatic improvement between 2015 and 2016. The second most improved country was Myanmar, which jumped 13 points to 140th place. Please see http://www.itu.int/net4/ITU-D/idi/2016/. Prime Minister Harris and the Amazon representatives pledged to work together through the Organization of American States (OAS), as Amazon and that multilateral institution are actively developing cooperation mechanisms to bridge the technological gap that exists among some countries in the Western Hemisphere. The joint agreement between Amazon Web Services and the OAS was announced just this month, which is National Cybersecurity Awareness Month in the United States. While at the Toronto Global Forum, Prime Minister Harris will have meaningful discussions with high-level private and public sector representatives. Moreover, the Honourable Prime Minister will champion the cause of St. Kitts and Nevis and the Caribbean by emphasizing the role of climate resilient infrastructure (adapting infrastructure to climate change) in mitigating the devastating impacts of climate change.